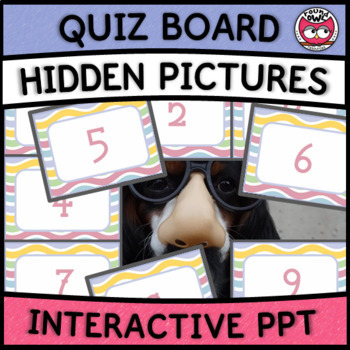 Use Hidden Pictures 2 as a prepared or spontaneous quiz where students answer your questions to slowly unveil a hidden picture. Ask any questions you like, in any subject. The questions are up to you. 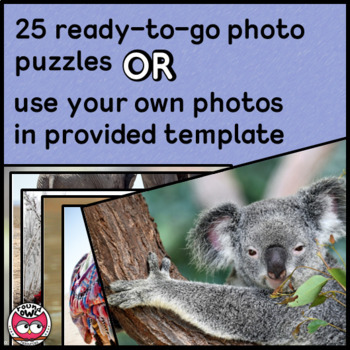 Hidden Pictures 2 is an animated PowerPoint where all the hard work is done for you! 9 squares cover a photograph. When individual squares are clicked, they disappear, revealing part of a picture. Perfect for interactive whiteboards or data projectors. So versatile because it can be used for any subject. A great way to revise content and do pop quizzes where the outcome is more than a score. You can even use this as a reward during class activities, nominating students who can choose squares to click and reveal throughout the lesson / activity. Why not use Hidden Pictures at the beginning of a session to settle or focus students. Or use at the end of a session to revise and check content. Even better!!! Purchase this product and receive a copy of Hidden Pictures - Christmas for free. File will be included in your download. Bonus offer valid until Christmas 2018.